Brenda is now in San Mateo on Evelyn's showcase for all to see her pout but ever so innocent that all you want to do is cuddle her up!! Before leaving on our trip to Alaska, Evelyn posted on Facebook many beautiful photos of Alaska. 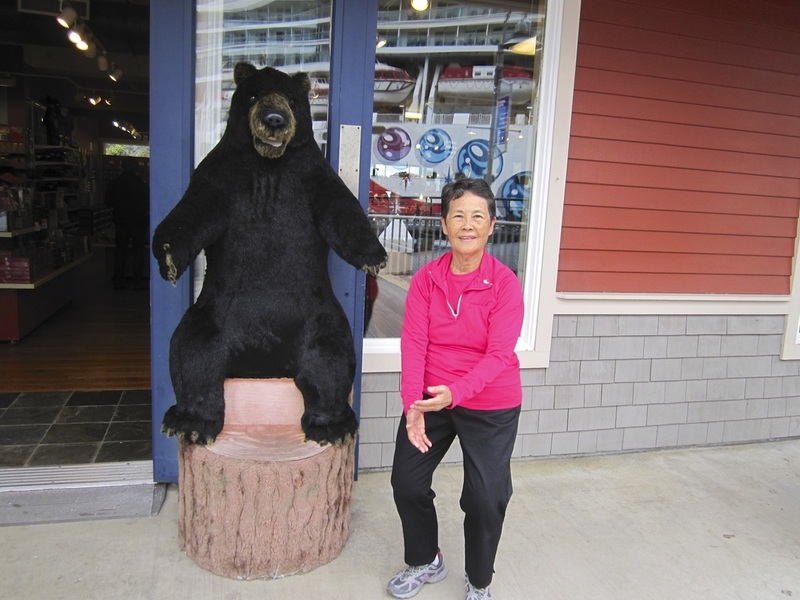 everydaytaichi lucy posts a comment: Evelyn, I am getting very excited about our upcoming trip to Alaska with all the nice pictures you have shared. 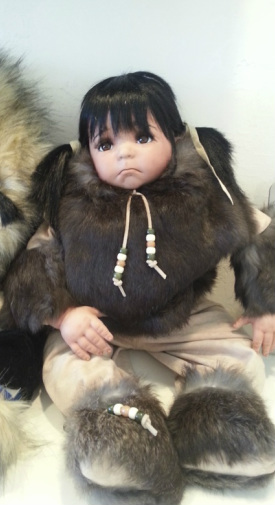 Evelyn emails me back to ask a big favor: Lucy when you go to Ketchican, go to the doll shop and ask the manager to email me as I am interested in buying an Eskimo doll who has a specific look on her face. Next, Evelyn gives me directions on how to get to the doll shop. Our cruise ship docked at 6AM and everydaytaichi lucy & ken got up early for breakfast, told our travel family that we were on a mission to locate Evelyn's doll. Don't worry about us we'll see you later. everydaytaichi mapped the town out and walked quickly as we were on a mission!! To make a long story short, we went into 3 or 4 different shops, 2 were owned by brothers who were extremely helpful. Once I showed him the picture of the doll he said with a smile, oh this doll is not from our shops but you can find her on Front Street at Alaska Heritage. Our dolls have a certain look and is made by our family. Once at this shop we made "friends" with the sale personnel and the girl in charge of the dolls had lived in Hawaii for a few months. She talked with Evelyn and proceeded to send her pictures of doll I felt she would like to consider. As they were busy with that transaction, everydaytaichi ken finds two native crafts. 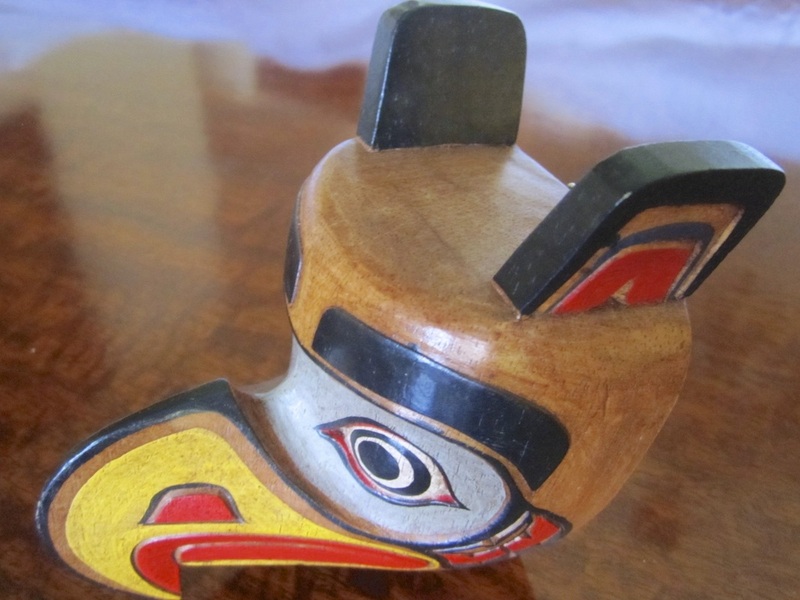 One is a nose mask of an eagle and the other an orca. everydaytaichi lucy gets into the buying mood too and finds herself talking now to the owner of the shop, who finds her a pendant that was just what I've always wanted... a blue diamond piece!! As it turns out Lee, the owner, has condominiums here in Hawaii on Nuuanu Street and told us her shop closes in September when the weather is cold and she moves on to her Puerto Rico shop. As everydaytaichi lucy and ken leave the store, Lee runs up to us and pins a Swarovski crystal whale on my lapel!! To all mentioned, thanks for all the nice memories and first time eperiences!! Ken's eye for nose masks. This time it's an eagle's nose mask. 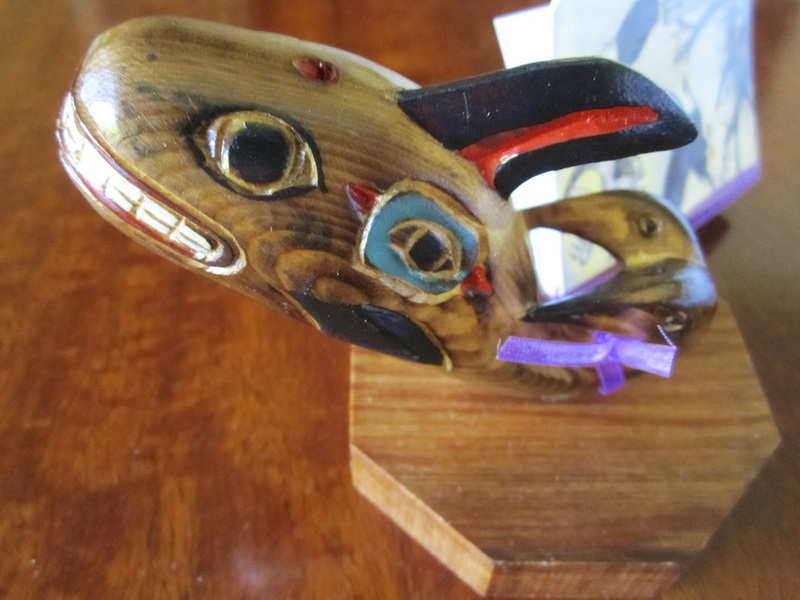 A handcrafted orca so we can remember something from our Alaska trip!